Big Trouble in Little Tokyo presents “Harold and Kumar Go to White Castle: Extreme Unrated Edition” on Wednesday, July 8, at 7 p.m. at the Japanese American National Museum, 100 N. Central Ave. in Little Tokyo. 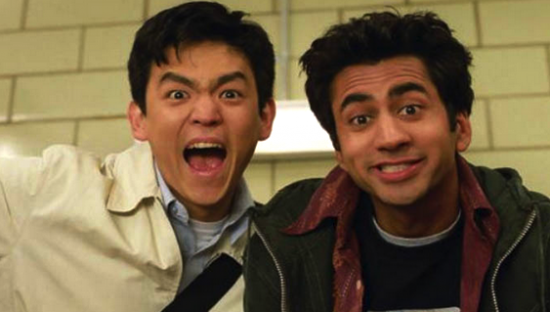 Directed by Danny Leiner, this raunchy 2004 comedy follows the life-changing and mind-altering journey of Korean American investment banker Harold (John Cho) and Indian American medical school candidate Kumar (Kal Penn). Both underdogs, Harold and Kumar decide to spend what would have been an uneventful Friday night trying to satisfy an oddly intense urge for White Castle hamburgers. But finding a White Castle proves a difficult task, and the two friends wind up on an epic road trip. The cast also includes Paula Garcés, Neil Patrick Harris, David Krumholtz, Eddie Kayte Thomas, Christopher Meloni, Ryan Reynolds, Fred Willard and Anthony Anderson. Big Trouble in Little Tokyo is a film series presented by JANM in partnership with Angry Asian Man, First Pond Entertainment, and Visual Communications. The series features specially selected films by and about Asian Americans followed by intimate discussions with cast and crew. Pre-sale: $8 for JANM and Visual Communications members, $10 general. At the door (if available): $12 for JANM and VC members, $15 general. For more information, visit www.janm.org.